The progressive retinal atrophy (PRA) is an inherited eye disorder leading to a degeneration of the photoreceptor cells of the retina. Fundus changes are bilateral and symmetrical. Initially, a loss of function of the rod cells is observed proceeding in night blindness and decreased adaptation of vision. In the final stage, degeneration of the cone cells results in complete blindness. 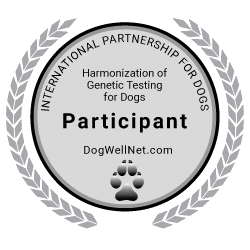 The onset of the diseases varies between different breeds but is often not diagnosed before the age of 6. To date there are two known mutations that are specific to the Golden Retriever, the so?called GRPRA1 and GRPRA2. Clinically their symptoms are difficult to discriminate. They also resemble the symptoms of the well?known prcd-PRA, which also occurs in the breed.